Has it really been 25 years? That is the question on the lips of most people who were the right age to be mesmerised by Jurassic Park in cinemas, and find themselves buying up what must be one of the best movie-based toy lines ever devised. Kenner, the action figure experts behind the Star Wars line, held the master toy licence for Steven Spielberg’s ambitious dinosaur film back in 1993. The appeal that Jurassic Park had for a young audience was the interaction between humans and dinosaurs – the inherent danger of being on an island with prehistoric beasts running amok. This was captured in the main toy line, which used different sized products to offer everything that the film did. Dinosaurs came in different formats. The smallest were carded creatures that included movie favourites such as the raptor and off-screen animals such as the dimetrodon. A slightly larger pair of electronic dinosaurs, a raptor and the dilophosaurus, made noises and had particularly good sculpting and decoration. Things got really interesting with the boxed dinosaurs that were roughly in scale to the smaller, carded creatures. The triceratops, stegosaurus, and young T-Rex were all produced in a soft plastic that gives the toys a strangely “real” feel. Of all of the dinosaurs, though, the most desirable was the extra-large, 60 cm. long Tyrannosaurus Rex. It was the biggest of all of the Jurassic Park launch products, with a roaring function and stomping action that very much appealed to the target audience. 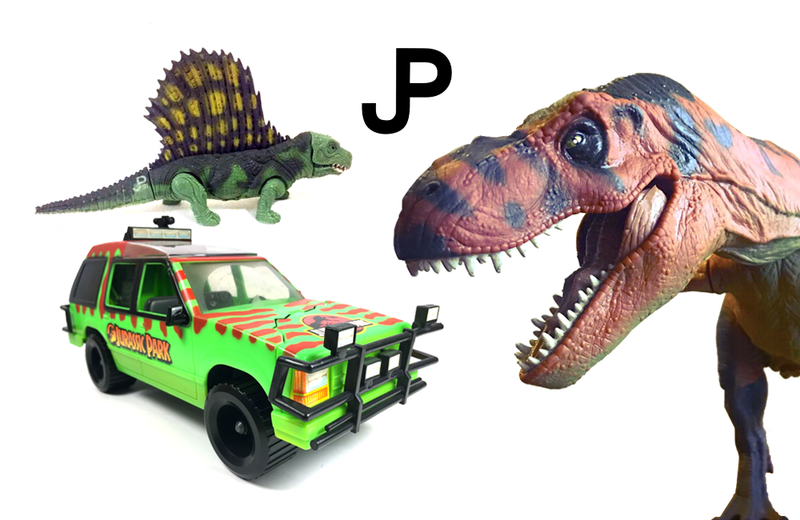 What really separated Jurassic Park from run of the mill dinosaur toys, aside from the quality and JP logo, were the complementary human action figures. The core characters from Jurassic Park were released in a rough scale with the dinosaurs, and each came with a baby beast. Some of the character likenesses were pretty iffy, but these improved with time and Laura Dern got off lightly. The humans themselves are perhaps less iconic than the vehicles, with excellent renditions of the Jungle Explorer and Bush Devil Tracker (better known as the jeep) featuring dino-destruction play options. As the success of Jurassic World caught everyone by surprise in 2015, the toy line was somewhat underwhelming. With the release of Jurassic World: Fallen Kingdom this summer, however, things are on track – many exciting toys are on the way! Particularly exciting is that Mattel seems to have taken inspiration from the original 1993 product line, with a nice balance between scaled action figures and dinosaurs. Graham Hancock is a toy collector and deputy editor of Blocks magazine. In 1982, Remco introduced the Official Sgt. Rock action figure toy line, based on the fictional DC Comics character of the same name. Humor Rumor is an over-the-top take on the classic ice-breaking party activity, "The Telephone Game."